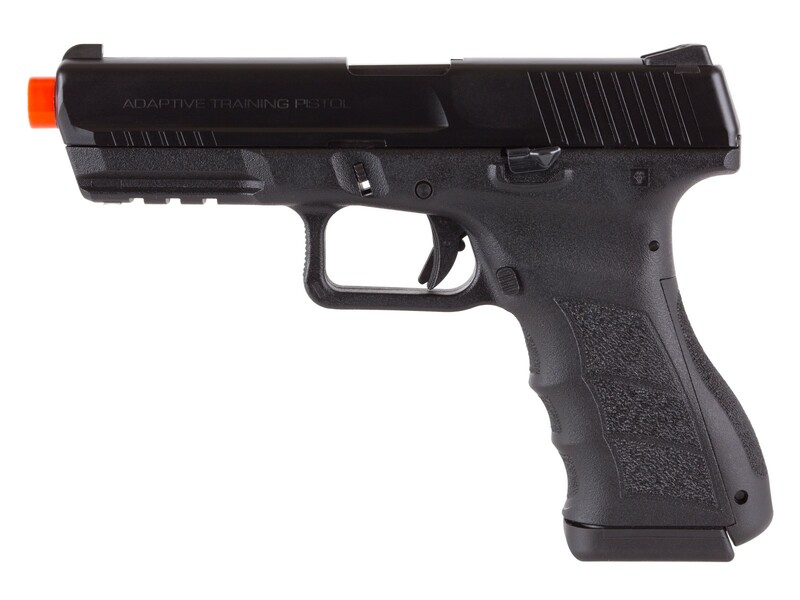 The KWA ATP (Adaptive Training Pistol) is a semiautomatic gas blowback airsoft gun that was developed in collaboration with law enforcement and military agencies. The ATP features KWA's NS2 gas system for enhanced functionality & crisp blowback recoil. This gun shares many similar characteristics of the M17 airsoft pistol. The grip angle & takedown are nearly identical, however, the ATP has an extended slide release & interchangeable back straps for a unique and comfortable shooting experience. The ATP features a full metal slide & durable polymer lower receiver, a 23 rd magazine, and a shot velocity of 320-350 fps (using .20g BBs). An adjustable hop-up unit lets you dial in the accuracy on your long distance shots. Mount optional accessories on the rail underneath the barrel for added effectiveness in the battlefield! Things I liked: This is a quality made gun. Very accurate but shoots low so am putting a laser on it. 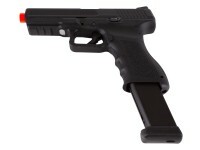 I love the sound and performance and is a realistic trainer for my Glock 19. Things I would have changed: Adjustable sights. What others should know: This gun is a pleasure to shoot. I would recommend to anyone who needs more practice but can't get to the range as often as they would like. Things I liked: The grip angle is more like a (centerfire) Springfield XD then Glock. I find it points very naturally. The stippling on the grip panels is very much like generation 3 Glock, as are the finger grooves. Trigger pull is excellent and feels like a heavily modded (centerfire) Glock. All other features (mag/slide release, take-down release etc. are in the same location and remind one of Glock. Things I would have changed: Sights move very easily. They will need to be Loctited after sighting in. 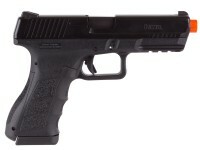 The pistol comes with combat sights. An option for rear adjustable (windage & elevation would be nice to compensate for various weight BB's. A (6.01mm) tight barrel supplied from the factory. This is a high quality pistol, but has a short barrel and I found factory accuracy lacking. What others should know: I purchased this pistol to prepare for an upcoming force-on-force training course. Originally, I was looking to duplicate my carry centerfire Glock. Cruising the foreign websites (where airsoft Glocks are still available) I quickly found out that the upgrades (metal slide, hop-up, nozzles etc.) needed to make the airsoft Glock close to the ATP would cost 2-3 times the price! I purchased the ATP and have not looked back. I replaced the factory barrel with a 6.01mm (KWA) tight barrel, reducing group size about 50%. KWA's (45 day) factory warranty is void if other than green gas is used. 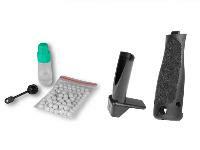 Pistol is shipped with no lubricant applied to any of the wear, o-ring or rubber surfaces. Factory manual explains break-down OK, just be aware. Make sure the magazine follower is lubricated as feed failure and slide locking on empty may be affected. Fill the mags with gas first, as the BB follower spring compresses the bumper spring making release more difficult. The 3/8" thick rubber bumper on the magazines must be slid forward or removed to fill mags with gas as the fill nozzle can't seal with it in place. The ATP is supposed to fit Glock holsters, I tried it in Kydex models from FOBUS (model EMG) and BLACKHAWK (model CQB). While the ATP fit, it would not engage the retention system of either model. So take your ATP with you or look for ATP specific holsters when shopping. I have about 1500 rounds through this ATP with no problems and enjoy it (maybe more) than my centerfire! Things I would have changed: Design magazines with more protection so they can be dropped w/o fear of damage. This would facilitate practice of speed reloads. Also make it easier to change the back strap. I could not drive the pin out to change the strap.